Little is known of the history of Long Buckby; but archaeological evidence suggests that it was built by 1150 AD. At this time, the De Quincy family held the manor. Like other Norman overlords they may have built the castle to control their newly aquired estates following the Norman Conquest. 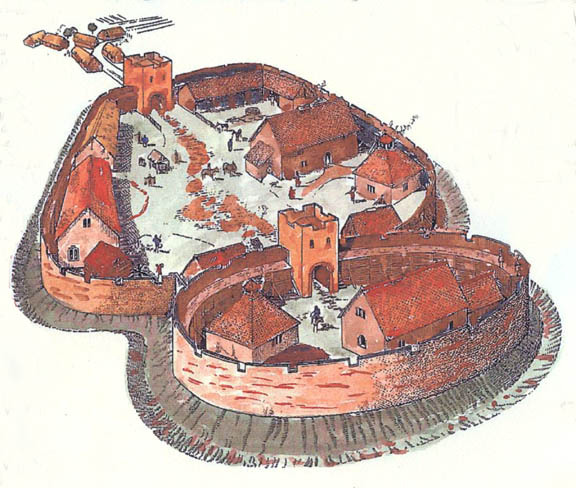 Occupation of the castle is thought to have ended sometime after 1200 AD. Many Norman castles were built of earth and wood and were defended by a timber wall built on an earth bank surrounded by a ditch or moat. The timber wall was plastered to resemble stone. Some of these castles were gradually replaced with stone structures while many others were allowed to fall into disrepair. The drawing and information on this web site is taken from a page bearing the name "Northamptonshire Archaeology Unit"
and was kindly shared by Mr. Victor de Quincey. Please visit the de Quincey Family Website. Please send any information to Robert Sewell. Click to return to Saher de Quincy of Buckby.